The Lord invites the people to enter into a special covenant with Him, which will result in blessing. Moses told the people and they agreed and chose to enter into this covenant (Ex. 19:7-8). The Lord then commands Moses to prepare the people and then presents to them the Law of God. In receiving the Law of God they will learn about what He requires of them. This law will instruct them on how they can approach God and how they can abide with God. God spoke and revealed the summary requirements of the covenant (Ex. 20:1-17). This summary is called the Ten Commandments or “the ten words” (Ex. 34:28). The first four commands relate to the people’s duty towards God (20:1-11) and the final six commands relate to the people’s duty toward one another (20:12-17). These commandments are later on repeated to the new generation of Israelites by Moses that prepare to go into the Promised Land under Joshua’s leadership (Deut. 5:6-21). These commandments reveal the holiness of God, the sinfulness of man, but also provide benefits to humanity when they are followed. 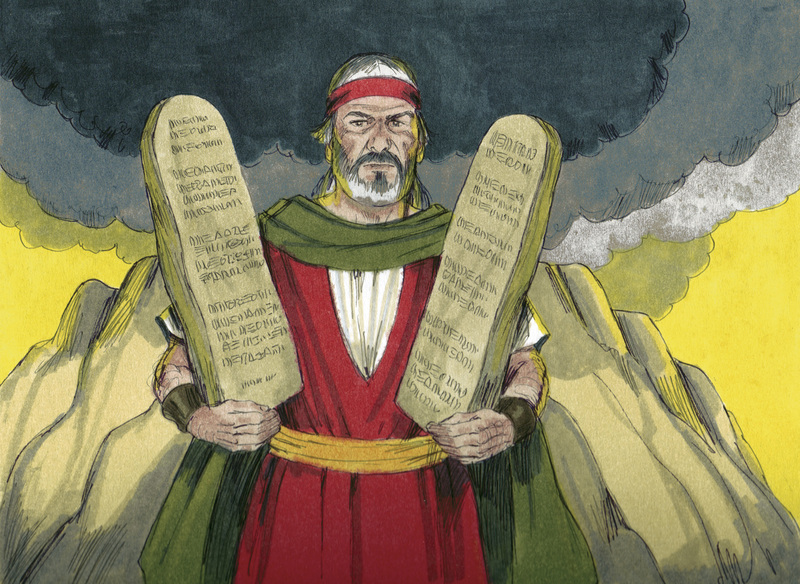 Nine of the Ten Commandments are repeated throughout the New Testament. This was a significant moment as God provided them with special revelation concerning Himself and what He required of them. After this, the people responded with fear when they saw “the thunder and the flashes of lightning and the sound of the trumpet and the mountain smoking” (Ex. 20:18). They requested that Moses tell the people what God had said, rather than hearing it from Him directly. Moses assured them that God isn’t going to kill them, but that He is tested them so that they fear the Lord (Ex. 20:19-21). Moses then goes up the mountain and God reveals to him the specific requirements of the covenant (Ex. 20:22-23:33). After the Lord gave these commandments to Moses, the summoned Moses and Aaron, Nadab and Abihu (Aaron’s two sons), and seventy elders of Israel (Ex. 24:1-2). Moses tells them what God has said, and they agree to them. So the people agree with the covenant terms (Ex. 24:3). Moses then reads the Law of God to the people and they again agree to live by the covenant. Moses sprinkles them with blood (Ex. 24:5-8). This act symbolically reveals that they are cleansed and that a substitute makes it possible for them to enter into such an agreement. Later on we learn that Jesus is the fulfillment of this (Matt. 26:28). Moses is then invited by the Lord to climb the mountain and there he will receive a copy of the covenant on tablets of stone. Joshua went up with Moses, and he asked Aaron and the elders to stay back and wait.